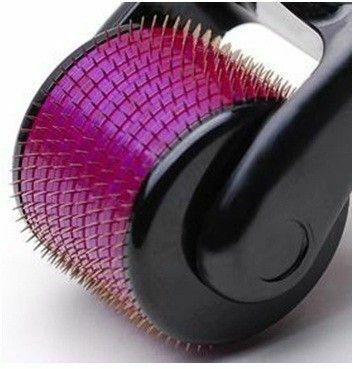 This Hair Regrowth Micro-needling Roller dramatically increases the effectiveness of your hair and skin care products by increasing absorption from the usual 4% to as a much as 87% of the product being absorbed deep in your skin! Utilizing the skin roller promotes production of collagen, resulting in skin rejuvenation, great skin elasticity, tightening and thickening of the skin. This roller will also, diminish the appearance of cellulite, stretch marks, clean heavy pitted skin, and assist in reversing the results of sun damage. When used on the head (scalp), it also stimulates the hair to maintain its thickness and help with thinning and balding hair areas. Dramatic results can be seen in one week! Stimulates hair growth, improves thinning/ balding hair areas. Wet your hair before using this roller on your scalp. This will help prevent your hair from getting tangled in the roller. Begin using it at the front of the scalp on or near the hairline and work your way down the back of the head (treating only the areas where hair loss has occurred). Focussing on one section of the scalp at a time, roll each area 10-15 times. You can do this by rolling horizontally, vertically and diagonally, three or four times each way. Roll in one direction only when the needles are in contact with the scalp (don’t go backwards and forwards) and try to roll from the hair roots to the ends. This will prevent any hair getting caught in the needles. Repeat this process until you have covered all areas needing the treatment.